The Little Theatre in Bath - a gem of an independent cinema that has survived since the 1930s despite the emergence of a city centre multiplex - showed the new print of It's A Wonderful Life this week to a full house, accompanied by mulled wine, minced pies and carols by local singers. 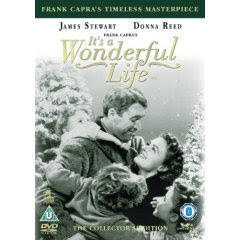 Frank Capra's dark but ultimately uplifting story about the difference that one person's life can make - in this case a small building society manager who survives against the odds - is as good as ever. I don't think I had seen the film for many years, despite the assumption that it is about every Christmas, but it is a truly great movie. James Stewart is magnificent as George Bailey with Lionel Barrymore as the nasty Mr Potter, a young Donna Reed as Bailey's wife and Henry Travers as the unlikely guardian angel. Released in early 1947, it sought to engender a spirit of post-war optimism, but Capra's idealistic small town America was probably doomed by that stage without too many nasty Mr Potters to speed up the process. Seeing it on the big screen is the perfect Christmas treat. Blogging will be very light until the New Year. We're off to enjoy a white Christmas in Bavaria. Happy Christmas and all the best for 2008 to my regular readers. Who said that political correctness was killing Christmas? There's news of another victory for one of the great traditions of Christmas here. News that David Cameron's own constituency party has had to return £7400 in illegal donations surely calls for an apology to the House of Commons. Francis Maude told the Commons on 4 December: "our donations have been properly made and properly declared, and all have been made by permissible donors." I trust that Maude will now apologise for misleading the House. After all, in the immortal words of Mr Cameron, it 'beggars belief' that he didn't know what his own constituency party was up to. And surely he would have shared such knowledge with his colleague before allowing him to mislead the House? Iain Dale has already decided that Nick Clegg, the new leader of the Liberal Democrats, will be forming a coalition with ex-PR man David Cameron after the next election. Isn't it just as likely that the Liberal Democrats will start to recapture their polling support, reducing that of the Conservatives back to the mid-thirties? How far is Hillary faltering? Today's Guardian highlights the December CNN poll to suggest that the national Democratic primary contest between Clinton and Obama is tighter than it actually is. It is not the first paper to chose the tightest poll rather than the more reliable RealClearPolitics average. In fact, two national polls have been conducted since the CNN survey - which gave Hillary a mere 10-point lead over Barack Obama - and both show Hillary with leads above 18-points. It is true that most recent polls show Obama ahead in Iowa, and that some have given him a lead in New Hampshire - though the latest for Fox News gives Hillary a nine point lead. It is also the case that Hillary has had a few problems over the last week. But she remains the clear favourite, and enjoys leads of 20%+ in all the big states which vote this time by February 5. In the age of the Internet, what is the point in supposedly serious papers exaggerating for effect? How long can this man hold a grudge? I know it must be intensely irritating to John Major (for younger readers, he was the British Prime Minister from 1990-1997) that he lost the 1997 general election, even if it was over ten years ago that it happened. It might be even more irritating to him if he could accept that he lost it because (a) he presided over one of the biggest economic disasters in recent decades - Black Wednesday (b) his parliamentary party was packed with liars and sleaze merchants and (c) he left the public services in a deplorable state of disrepair, with falling education budgets, soaring hospital waiting lists and the first stages of an immensely cack-handed privatisation of the railways. Or that he had any responsibility for the genocide of at least 80,000 Europeans because of his government's refusal to allow Bosnia to defend itself. Given this record, is this elder "statesman" really the best person to provide lectures on good governance? And is the Andrew Marr show really so short of guests that its highlight this weekend was giving the biggest grudge in politics since Ted Heath lost to Margaret Thatcher yet another airing? To Dublin for a pre-Christmas weekend to see family and friends. Taking the Ryanair flight from Bristol is the only way to get there now that Aer Lingus has stopped doing the route. The service is ahead of time and very efficient, as well as reasonably good value despite the 'extras' like check-in luggage. But what is intensely irritating is having to listen to 50 minutes of inane chatter fumbled through by a crew that seems unfamiliar with reading English (or perhaps they just have better taste than to familiarise themselves with the gibberish given to them by Michael O'Leary) as we are sold newspapers, coffee and tea, lottery tickets, gift vouchers and other dubious offers. The 'raffle' had to be drawn four times before anyone on the half-full plane claimed their prize of an immensely complex Ryanair voucher. Is it possible to pay an extra fiver a head just for a bit of peace and quiet? The annual whinge about the Government's goals for nursery education took place recently. Here's another good reason why we cannot afford to confine early learning to the middle classes. Former PR man turned Tory leader David Cameron knows a good thing when he sees it. So it is no wonder he has taken to sharing his increasingly unoriginal thoughts with Radio 4 Today listeners on an almost weekly basis, in the sure knowledge that the questioning will be little more threatening than had he been doing the exercise for a Tory PPB. I'm with Ben Brogan on this: or is it only Labour ministers who get a tough time on Today? Is the Children's Plan focused enough? I've now had a chance to read through the Children's Plan . There is no doubting its ambition; it confirms quite a lot that was already in train, adding extra resources and targets including more nursery places for two year-olds, well-equipped children's centres and better youth facilities. There are well-trailed initiatives on everything from new adventure playgrounds to a clampdown on inappropriate videos and websites. Plans for progress tests by stage rather than age are confirmed - Ed Balls gave some encouraging reassurance in his statement to the Commons on how they will be taken forward in the future. There is welcome recognition of the importance of data in raising standards, and a reaffirmation of proposals in the 2005 Schools White Paper - which are already underpinned by legislation - to give parents proper information on their children's progress. Jim Rose's review of the primary curriculum is also confirmed, and there are good ideas on improving school leadership and teaching - especially the Finnish-style Master's Programme for existing staff. But wading through the 168-pages, I am left with a niggling concern that the agglomeration of initiatives - many doubtless worthy in their own right - could distract from the central task of raising standards for all. There is a danger of a lack of sufficient focus. 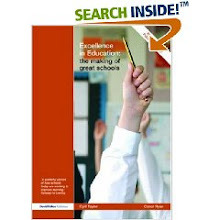 For example, Rose's phonics review from 2005 should be being implemented vigorously now across all primaries, yet phonics is not prioritised in the Plan; for many schools, there is a real danger of a clamour to join in these many other initiatives, distracting them from them their primary task of improving the basics. Shouldn't one question for the new Rose review be to decide not just which curriculum subjects should remain a requirement for primary schools, and their relative importance, but also the extent to which attempts to make schools an extension of social services are genuinely helping (or hindering)the drive to raise standards for all, and the relative value of the linked initiatives? The government is placing considerable store on its new Children's Plan to be published on Tuesday. Newspapers have been filled with tales of bans on TV advertising and other 'talking point' issues guaranteed to gain space on a Sunday. But what will matter most is what is planned for the primary school curriculum. And in that respect, it is good news, as Ed Balls told Andrew Marr this morning, that Sir Jim Rose, the former Ofsted inspector who led the 2005 review of reading, is to lead a review of its content. His presence should ensure a sound series of recommendations. There are some clear priorities. For a start, the government must ensure that phonics is being used much more widely to teach children to read early on. And the teaching of the basics must be given the level of priority in primaries that it had before Charles Clarke's decision to emasculate literacy and numeracy within an all-embracing primary strategy. Then, it is right to turn testing from a one-off event at 11 for all into progress testing while ready, so long as the tests are externally set and validated, and performance tables continue at Key Stage 2; but, a similar approach is needed for 7 and 8 year-olds so that teachers and parents have an accurate baseline from which to work. Finally, Rose must be given the freedom to cut the clutter in primary schools. That means teachers not being expected to put social work before teaching; by all means, provide the wrap-round facilities around schools, but don't clutter the curriculum in ways that divert primary schools from their primary task. Gordon Brown is absolutely right to boycott the Lisbon summit over the European Union's disgraceful decision to invite Robert Mugabe. If the EU were really serious about African development, they would not invite the demagogue whose policies have turned what was once the bread-basket of Africa into its basket-case, and whose contribution to any discussion about Africa's future must be worse than useless. Bronwen Maddox put the case well in this morning's Times. Instead of making fatuous comments, the EU President, Jose Manuel Barroso should take responsibility for ensuring that when the EU introduces sanctions, they are upheld. It is good to see the Czechs upholding EU values too - they know enough about appeasement having experienced it in 1938 and 1968: it is somewhat dispiriting that nobody else could bring themselves to do so too. The closer we get to the Iowa caucus - a peculiar affair, which doesn't lend itself easily to polling, a point well made here in the New Republic - the better Barack Obama (right) seems to do. And there is a real possibility that Obama will win in Iowa, just as Romney or Huckabee could win over Giuliani for the Republicans. A win in Iowa would undoubtedly boost Obama, but if he loses there, he is as good as finished in the campaign as a whole given that his team has showered resources on the relatively small group of Democrats entitled to vote. But none of this means much if Clinton and Giuliani win in the big states that will be contested fairly soon after New Hampshire. So, today's LA Times/Bloomberg poll should give considerable encouragement to the Clinton camp. It shows Hillary with a commanding 24 point lead among Democrats, but most telling are the figures about who is ready to be President. Most Democrats think Obama would be better waiting a few more years. Indeed, Huckabee looks a far greater threat to Giuliani than Obama is to Clinton. Mick Brookes, the general secretary of the National Association of Head Teachers, was playing the caricature of the teachers' union leader on the radio this morning. He told John Humphrys (go to 25 minutes in) that he was all in favour of tests, just so long as the rest of us couldn't see the results. And as newspapers reported that a handful of schools had been disqualified for cheating, his response was not to condemn such practice, but to condone it: apparently the pressure of the league tables had got to them. Well, the pressure of testing and tables has indeed got to a lot of primary schools, and in a wholly beneficial way. It has driven up the performance of many of the weaker schools rather faster than the national average levels of improvement, without cheating. But for Mr Brookes this is all too much. It is not enough that thanks to tests and tables, schools can see exactly how other schools in similar circumstances are doing, and that many with very high levels of pupils on free school meals or significant numbers of pupils with a first language other than English reach or exceed the national average. But because the tables put 'pressure' on other schools to do as well, forcing them to ensure that their pupils can read, write and do basic maths - the basic duty of primary schools - the tables are to be condemned. Does it not occur to the heads' leader that unless these pupils can read and write properly, they will find it rather difficult to access the 'liberal curriculum' that he so eloquently desires? David Cameron was the clear loser of PMQs (video link) this week. He lacked the focus and self-assurance that he had shown in previous weeks. He didn't seem to know what subject to focus on - perhaps mindful of the questions increasingly being asked about Lord Ashcroft and his tax status. Meanwhile, despite - or because of - the problems he faces, Gordon Brown seemed finally to have acquired the self-confidence he had lacked in earlier bouts. He had a good line on the party funding affair, which left Cameron looking shifty and surprisingly unsure of his ground. Brown even had a good putdown for last week's creator of the Mr Bean jibe, Vince Cable. UPDATE: Tom Watson has helpfully published the full exchange between a Tory frontbencher David Ruffley and Andrew Neil over the Ashcroft question on his blog. Coming a week after the PIRLS reading survey, today's PISA results appear to confirm a trend. It is not, as the more excitable right-wing commentators suggest, that our students have dipped significantly in their performance because of central government policies - in fact on reading and science, only seven countries score significantly higher than England (though, our maths performance is rather less good); rather, it is that some other countries that have introduced strong reforms are improving faster. As I argued around PIRLS, the intensity of the strategies around literacy and numeracy (and this is as true at Key Stage 3 - age 14 - as it has been at Key Stage 2 - age 11) was lost between 2001-2005. In primary schools, the focus is being re-energised; in secondaries, the requirement that English and Maths results are included in the five good GCSEs recorded in the league tables is starting to have a similar effect (it is noticeable that far more pupils get a GCSE C+ in English than Maths (See Excel Table 7)). But the lesson of these international surveys is not that we should abandon testing, leave teachers alone or give up. Have a look at the dismal performance of Wales - against which 16 countries do significantly better on reading - to see what that approach brings. It is instead that - as the 2000 and 2001 surveys showed - when government has a clear overall strategy, schools are clear about their priorities and public accountability is strong - then pupils will achieve not just at the average level of their international counterparts, but significantly above average. Hugo Chavez has been defeated in his attempt to ensure leadership for life in Venezuela. The self-proclaimed heir to Simon Bolivar, who is helping to keep Cuba's economy going and whose defender on Newsnight last night was none other than 'Gorgeous' George Galloway, has not been defeated by the forces of the evil empire, aka the United States, but by the decision of many of his own supporters to stay at home or vote 'No'. Whatever good Chavez may be doing in the barrios of Caracas is undone by his own megalomaniac tendencies, and he needed a democratic vote like that this weekend to remind him of this. As for those who imagine that, Venezuela and Bolivia aside, Latin America is a hotbed of imperialism, the reality is that social democratic leaders have won power in Chile, Brazil, Argentina (after a fashion), Uruguay and Peru, and they are introducing significant reforms without screwing up the economy. Conor Foley has a good piece on the two strands of leftist politics in Latin America here. Democracy is alive and well in Latin America after far too many years of dictatorship. It is good that this is true as much in Venezuela as it is in Chile or Brazil. Gordon Brown has today appealed for cross-party support for his plans for a shake-up of the funding of political parties. At the end of a dismal week of media feeding frenzy, falling poll ratings and increasingly desperate media revelations - which Adrian McMenamin rightly puts in their proper context - I don't think Gordon goes far enough. We can't have any more half-hearted measures on party funding. It is time to limit donations to a relatively modest £5,000 rather than £50,000. It is time to stop the Tories from making a mockery of the current rules about constituency spending, and taking money from third party donors through the Midlands Industrial Council. It is time to put an end to the Liberal Democrats being bankrolled by £2.4m donations from the likes of Michael Brown that they still haven't returned: perhaps the sanctimonious Chris Huhne could let us know whether he plans to do so if he is elected leader. And it is time for Labour to stop relying on trade union millions. Instead, as Denis McShane says in an excellent piece for today's Telegraph, let's have some proper party funding from the state. And if we want to know how to pay for it, here are two ideas. First, slash the £26 million bureaucracy of the Electoral Commission (which can be done by focusing it on compliance monitoring alone). And second, ban political billboard advertising. Add in the millions that we already give the Opposition parties every year, and politics is cleaner at little extra cost to the taxpayer, and more affordable too.